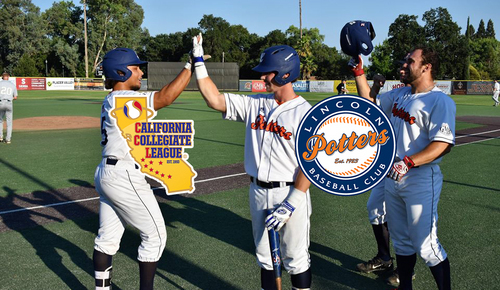 Lincoln, Calif. - The Lincoln Potters have announced that they will be joining the distinguished California Collegiate League beginning in 2019. The move comes after the club spent the past two seasons as a member of the Great West League. The California Collegiate League was founded in 1993 and is funded in part by Major League Baseball with an association with the National Baseball Congress. The addition of the Potters to the CCL will form a North Division consisting of the Healdsburg Prune Packers, Solano Mudcats, and San Francisco Seals. The South Division is currently comprised of established organizations such as the San Luis Obispo Blues, Santa Barbara Foresters, Conejo Oaks, and Orange County Riptide. “All of the teams in the South Division are excited about having Lincoln in the CCL,” CCL Commissioner Pat Burns said. “Together we have created another layer of quality competition that will give our players something bigger to play for,” he added. The move to the CCL unites the Potters with other well-respected teams in California and also affords the Potters some flexibility in their scheduling efforts. “Being part of the CCL will allow our fans to attend more home games on better days throughout the summer,” says Potters’ owner Isabel Domeyko Taylor. Instead of playing a round-robin 60-game league schedule, the Potters will now compete in roughly 30 home games and 15 road contests. The Potters will also play the majority of their home games Thursday through Sunday while eliminating most of the Monday, Tuesday, and Wednesday games. Each team in the North Division of the CCL will play a 24-game league schedule, meeting up with the South Division for the Fox Sports televised Prospect Game (All-Star Game) and the league playoffs the last weekend of July. In addition to the 24-game league schedule, the Potters will play against some familiar and new non-league opponents to round out their schedule. More details regarding the upcoming 2019 Schedule will be released soon. For more information about the California Collegiate League please visit their website at www.CalSummerBall.com . Season Tickets and Mini-Plans will be released to the general public beginning November 15, 2018. Full-Season Tickets start at just $149 and Mini-Plans can be purchased for as low as $35. Group outings in the VIP Area tabbed as The Kiln start at $20/person for all-you-can-eat and drink. The Lincoln Potters office is located at 436 Lincoln Blvd. Ste. 104. The office is located in the Lincoln Brand Feeds Building directly below Old Town Pizza. The Potters office hours are Monday through Friday, 8 a.m. - 4 p.m.
©2019 Lincoln Potters. All rights reserved.